Your DonorPerfect Payment Services Account is included with your DonorPerfect system. All you have to do is activate it! And with no monthly fee, no setup fees, and no annual fees, why wouldn’t you? Save time, reduce costs, and raise more money for your mission with integrated forms exclusively built for DonorPerfect and perfectly customizable to meet your organization’s unique needs. Forms include an optional Donor Covers Cost feature that allows each donor to cover the small fee associated with processing a gift. You can accept donations no matter how your donors choose to give and process: credit or debit cards, ACH e-check bank transfers, or even paper checks – directly through DonorPerfect. 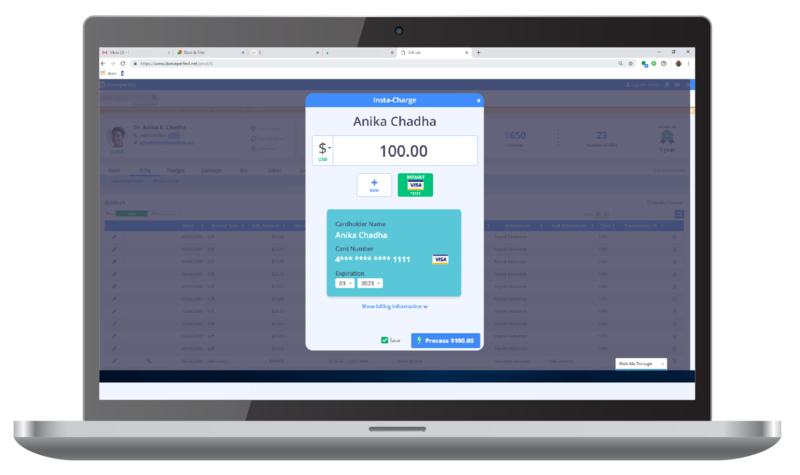 Take the hassle out of processing monthly gifts and membership renewals with pre-authorized payment processing that’s PCI-compliant and integrates with DonorPerfect. Watch the video. Collect donations anytime, anywhere from your phone or tablet with DPMobile using your keypad or our mobile swipe device. DPMobile Swipe is great for one-time donations at fundraising events and all transactions flow into DonorPerfect. SmartGive links make online giving easier and faster for your donors. With this time-saving feature, you can generate form links that are pre-filled with donor information, so they can give in seconds. Instantly authorize credit card gifts in-person and over the phone. Perfect for one-time donations, this tool sends gift and donor information right into your DonorPerfect system. Make payment processing a snap! Integrated payment processing reduces administration time and helps ensure collection of pledges. Stop losing recurring donors due to changing account information! Save time by eliminating the need to manually track and update expired or replaced cards. With Account Updater, you’ll process more recurring gifts without any extra administrative work. Nonprofits who use DonorPerfect’s Account Updater have seen as much as a 31% increase in successful monthly giving collection. Don’t settle for PayPal®! DonorPerfect Online Forms are the best choice for DonorPerfect clients because they’re made for fundraising. Let’s break down the benefits! Save lots more time thanks to integration. Get the full donation through Donors Cover Costs. Accept recurring gifts with no donor login required. Choose from over 25 pre-designed, mobile-responsive templates and customize with your logo and colors!